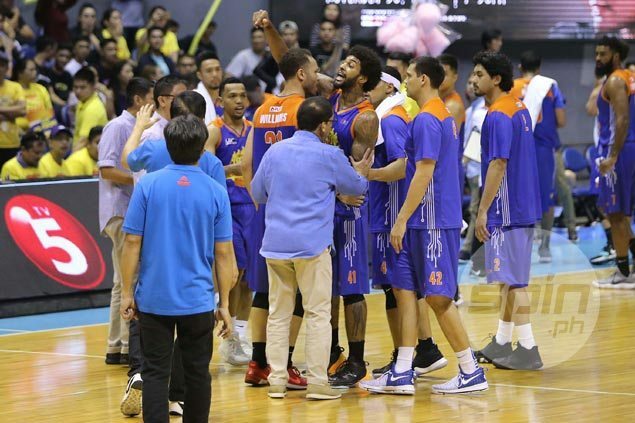 Temperamental import Glen Rice Jr. finally sent a letter of apology to TnT management saying he regretted his action that led to his ejection from Game Four of the PBA Governors Cup semifinals between the Katropa and eventual champion Barangay Ginebra Kings. The letter dated Oct. 27 was addressed to team alternate governor Patrick Gregorio, team manager Virgil Villavicencio, coach Nash Racela, and lead deputy Josh Reyes, a copy of which was obtained by SPIN.ph. “I would like to sincerely apologize for my reaction and explain to you all that my passion for the game of basketball take my emotions to another level that sometimes come out wrong,” read part of Rice’s letter. 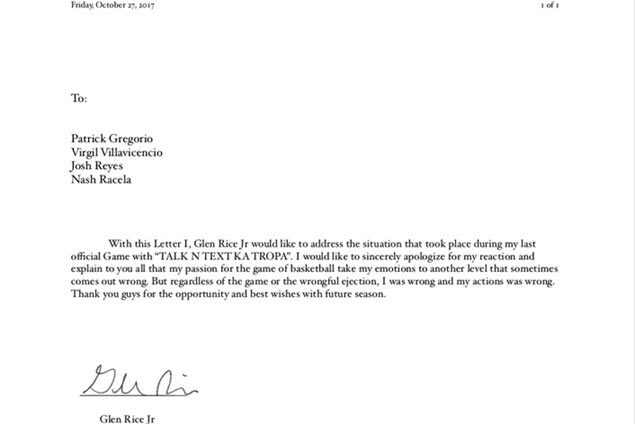 Rice obviously drafted the letter to gain TnT clearance for him to be able to play in another league following the unpleasant parting of ways. The native of Miami, Florida is suiting up for the Hapoel Holon ballclub in the Israeli Premier League. Rice’s apology came almost three weeks since the semifinal incident in which the 26-year-old son of NBA great Glenn Rice was banished from the playing court after being whistled for a flagrant foul penalty 1 against Ginebra rookie Kevin Ferrer and a corresponding technical foul for throwing the ball at the fallen 6-foot-4 forward out. The former NBA player later totally snapped and had some choice words for Gregorio. Rice also taunted and made obscene gestures directed at Ginebra fans while he was being led out of the Smart Araneta Coliseum playing court. Two days after his outburst, Rice returned to the US without talking to any top TnT official. The fine was apart from the P26,000 penalty imposed upon him by the PBA for various infractions during Game 4 – from committing the flagrant foul penalty 1 and technical foul on Ferrer, to the use of dirty finger, and for disrespecting league and team officials. Nonetheless, Rice still wished TnT well. “Thank you guys for the opportunity and best wishes with future season,” were his parting words for the team.